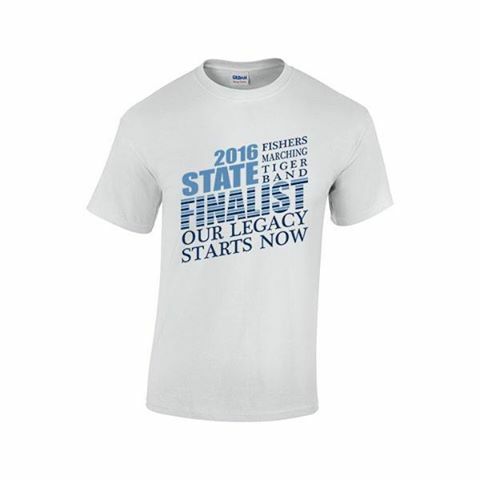 Let’s commemorate our legacy by purchasing the first-time ever Fishers High School Marching Tiger Band 2016 State Finalist t-shirt! One time only; no future sales. Absolutely no sales accepted after the deadline. Marchers must purchase their own shirts as they will NOT be provided. However, marchers are NOT required to purchase the shirt. Orders will be delivered before State competition. Exact day/time to be announced. Order yours NOW at: https://www.agpestores.com/gotellgraphics/groups.php. Please direct all questions to the Spirit Wear Committee at: spiritwear@fishersband.org.